In Jacqueline Winspear‘s powerful story of political intrigue and personal tragedy, a brutal murder in the British garrison town of Gibraltar leads Maisie into a web of lies, deceit, and peril. Spring 1937. 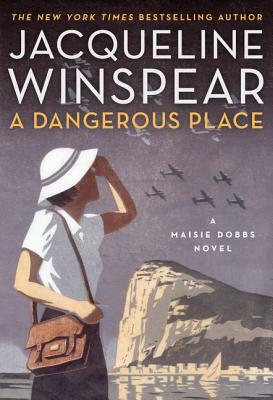 In the four years since she left England, Maisie Dobbs has experienced love, contentment, stability—and the deepest tragedy a woman can endure. Now, all she wants is the peace she believes she might find by returning to India. But her sojourn in the hills of Darjeeling is cut short when her stepmother summons her home to England; her aging father Frankie Dobbs is not getting any younger. But on a ship bound for England, Maisie realizes she isn’t ready to return. Against the wishes of the captain who warns her, “You will be alone in a most dangerous place,” she disembarks in Gibraltar. Though she is on her own, Maisie is far from alone: the British garrison town is teeming with refugees fleeing a brutal civil war across the border in Spain. Yet the danger is very real. Days after Maisie’s arrival, a photographer and member of Gibraltar’s Sephardic Jewish community, Sebastian Babayoff, is murdered, and Maisie becomes entangled in the case, drawing the attention of the British Secret Service. Under the suspicious eye of a British agent, Maisie is pulled deeper into political intrigue on “the Rock”—arguably Britain’s most important strategic territory—and renews an uneasy acquaintance in the process. At a crossroads between her past and her future, Maisie must choose a direction, knowing that England is, for her, an equally dangerous place, but in quite a different way.